Heineman Middle School seventh-grade student Grant Winsauer received the Infinitec Outstanding Student Technology Award. 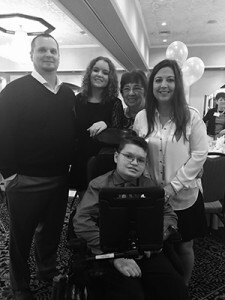 The award recognizes students with disabilities who excel with the use of assistive to access their curriculum and to gain independence in their school environment, at home and within the community. Winsauer was recently diagnosed with Myasthenia Gravis, a chronic neuromuscular disorder characterized by significant muscle weakness that impacts activities most individuals take for granted, such as standing, walking, sitting, swallowing, talking, writing, and breathing. Smith said the District 158 Special Services Assistive Technology team worked closely with Winsauer and his family to identify technologies that best support his needs. The team has helped Winsauer use an iPad which is specially mounted to his wheelchair on which he can complete a number of tasks. In addition, specialized software helps him complete school work while reducing fatigue. Among these applications are CoWriter, an application that offers “word prediction” so Grant can decrease keystrokes, and Learning Ally, which provides access to 80,000 human-narrated audiobooks, enabling Winsauer to keep all his books online and digitally accessible. The wheelchair mount also easily allows interchanging the iPad with other devices, such as an iPhone, for other uses when not at school. Smith said this ability to use assistive technology in all environments,not just at school, significantly decreases the likelihood of abandonment and helps the tools become a natural extension of the user himself. “In the future, it will be possible for Grant to use his technology to live and work independently by using environmental controls (lights) and navigation systems (bus routes) for example,” Smith said. Winsauer also is an active participant in many extracurricular activities, including the Service Club. He and his family attended the Infinitec Awards Dinner in April along with 10 members of the District 158 staff. In addition, a fundraiser will be held June 12, 2016 for the Grant it Forward organization. That organization was recently formed after the Winsauer family generously donated to a family who was unable to procure one an adaptive bike originally intended for Grant. The event will supplement the Friendship Circle’s Great Bike Giveaway, which annually donates hundreds of adaptive bikes to young people. Congratulations to Grant and the Special Services team!